Sanjay came to see me about a persisting and most troubling painful problem that is common in cyclists, pudendal neuralgia. We worked together towards his picture of success, following the principles of the Pain Coach Programme. As ever, the focus was to understand pain and move onto live a fulfilling life. The old tale ‘good, bad, who knows?’ illustrates the continuity of life, or impermanence, as we live life’s ups and downs. This is such a narrative here as you read about the joy of cycling, the suffering caused by the pain and the consequential limitations, the freedom of overcoming pain, the birth of an idea and the use of strengths to create something new, with purpose. Here is Sanjay’s story in his own words. Most keen cyclists have experienced the addictive nature of being on a bike, the sense of freedom, speed and the happy effects of serotonin. I always loved riding my metallic blue Raleigh Grifter as a kid and unfortunately didn’t have an opportunity to upgrade to a bigger bike once I out grew the Grifter. Many years later I rediscovered cycling again when my arm was twisted by colleagues at work to take part in the London to Brighton charity ride. I loved the experience and fell back in love with cycling again. My time on the bike increased and the challenges got harder. It took a few years to build up the confidence to join a cycling club, but when I did I never looked back. I met an amazing group of new friends and inspirational people. I would generally ride a few sportives every year and managed to get a saddle sore after a sportive a few years ago. I’m not very good at staying off the bike and didn’t help the healing process by getting back on the bike before it healed properly. This led to a persistent saddle sore. After various antibiotics creams and tablets the sore still persisted. I had based most of my free time and social life around the bike so found it challenging mentally when I wasn’t able to ride. One day at work I suddenly developed a pain around my sit bones that extended down my leg, it felt like a strange pain, almost electric and was worse when I was sat down. As if the saddle sore wasn’t enough I now had another issue to deal with. Over a period of a couple of months, I saw 5 different doctors and 4 different physios and still didn’t have any improvement or diagnosis. At times, it felt like the pain was getting worse and I was spending a lot of time on my feet to avoid sitting. Depression was starting to sink in as a result of the pain and inability to do the normal things that I enjoyed doing. I decided to get an MRI scan done and this showed inflammation at the point of pain near the sit bone. This provided some hope so I then started treatment with a physio to treat this condition and after a couple of months the pain just got worse. Next stop was a pro-cycling team physio and doctor who both worked together to finally give me a diagnosis. It wasn’t the news I wanted to hear, a trapped pudendal nerve. Also known as Pudendal Nerve Entrapment (PNE). I turned to Google for advice and struggled to find any good news about recovery from the condition. The doctor suggested cortisoid injections or a powerful antidepressant with the side affect of numbing the nerves. Knowing that these options were just masking the root cause I started working with a clinic that specialised in nerve injuries including the pudendal nerve. They had knowledge of the injury and I did have some progress however after months and months of treatment, I had only around 10% improvement and still couldn’t sit without pain. I was very low during this time and began searching for answers again. I came across Richmond Stace’s pain physio website and something seemed different about Richmond’s treatment. I quickly booked an appointment. I walked into Richmond’s office very depressed and without hope and walked out with the belief that I could recover. Richmond had a different approach to anyone else that I had seen. He helped me understand the cause of the pain and that knowledge led to empowerment and therefore belief that I could overcome the pain. Richmond provided tools including visualisation techniques, motor pattern training and mindfulness practices. Richmond provided a programme of treatment and adapted and progressed the plan based on my progress. I started sitting again very quickly after treatment and running again after only a few weeks. I was back on the saddle for short periods after a few more weeks and back on the road riding again after a couple of months. It felt amazing to ride again after 8 months off the bike and gradually over time the pain completely disappeared. During the time I was having treatment with Richmond, my contract finished so I was no longer working. Richmond mentioned a book called ‘Screw Work Break Free’ by John Williams. I quickly bought and read the book and felt inspired to pursue something more meaningful. A few years earlier I had dreamt of creating my own natural and eco-friendly cycling nutrition brand and this felt like the perfect opportunity to start making the dream come to life. As I was spending more time on my bike over the years I realised that most of the sports nutrition options on the market were highly processed, high in sugars and gave me stomach issues. I started making my own bars with real food ingredients and they tasted so much better plus my stomach was much happier. The path to taking the products from my kitchen to a manufacturer was not an easy or quick one, there were many obstacles and the ability to adapt was key. I stuck to my values throughout the process and that included only using the best quality real food ingredients, sustainability and creating an inclusive brand that inspires people to ride and get involved in sports whilst eating well. 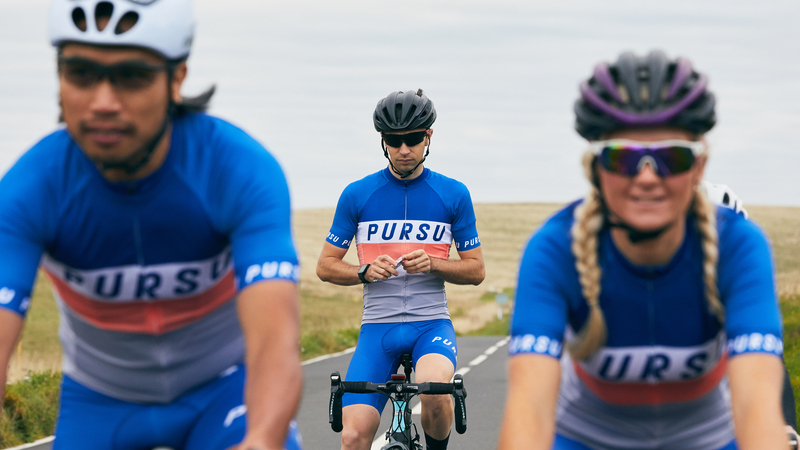 Pursu will be launching in March 2019 and the name has been inspired by the Pursuit cycling events and represents the Pursuit of better nutrition, the Pursuit of goals and ambitions. The launch bar packaging will be 100% home compostable and is made out of bio-based materials. In addition we have partnered with a great charity called Recycle (re-cycle.org) who supply unused bikes from the UK Africa to help improve lives through the power of bicycles. It seems like a long time ago that I wasn’t able to see a way out of the constant pain. Not only did I recover completely, an opportunity to pursue a dream also came my way. Before I met Richmond, there was little hope for recovery from PNE. I know there are other cyclists with the same or similar conditions and I hope my story provides hope to them. You can keep updated with progress and competitions on Instagram @pursunutrition and sign up for a launch discount at pursu.co.uk.